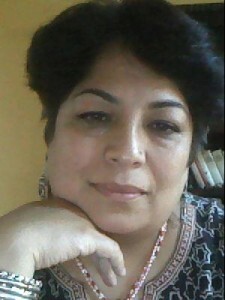 I spent the first 25 years of my life in India where eating beef was a major no-no! When I came to the US to attend graduate school, it took me a couple of years before I felt comfortable eating beef. It was not that I was religious or that I followed anything of the Hindu tradition, somehow it was just not in my dietary vocabulary to eat beef and so I never ordered any and clearly I didn’t cook any either! Now that I look back, I realized that I probably should have shed my inhibitions a lot earlier – ‘cause I sure know now what I had been missing. Of course, now that I have a typical carnivorous teenaged son who loves his steak, steak is a stable at our house. We like our steak and we like our steak rare! I have gone from never eating any to eating it while it is almost still walking! 1. 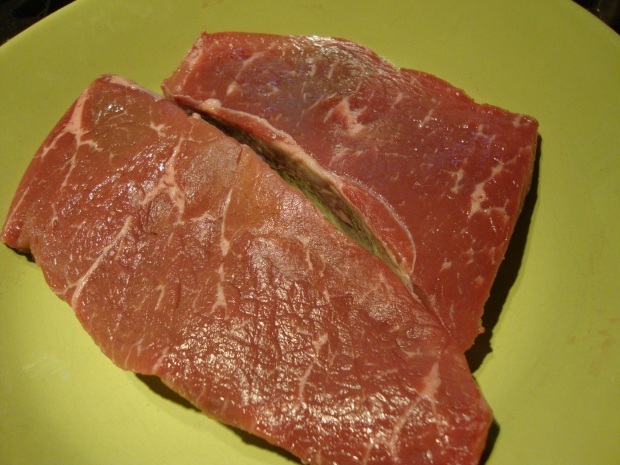 One hour before you need to cook the steak, take the meat out of the refrigerator and bring it to room temperature. 2. Using a mortar and pestle grind the pepper corns roughly. 3. 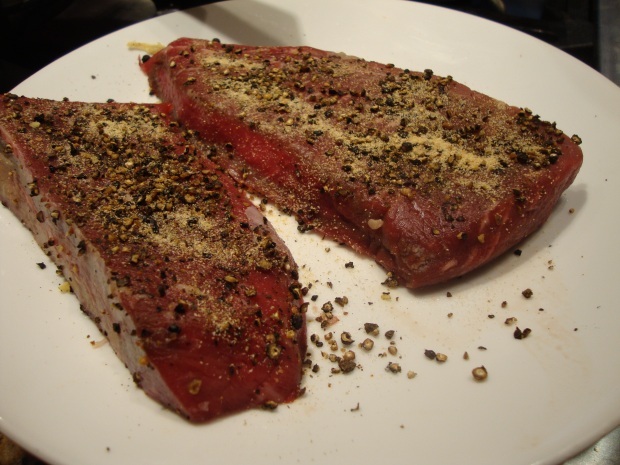 Coat the steaks (on both sides) with the ground pepper and using your hands, push the pepper into the meat. 4. Sprinkle salt and garlic powder evenly on both sides of the pieces of meat and set them aside. 5. Peel and slice the onion in thin slices. 7. 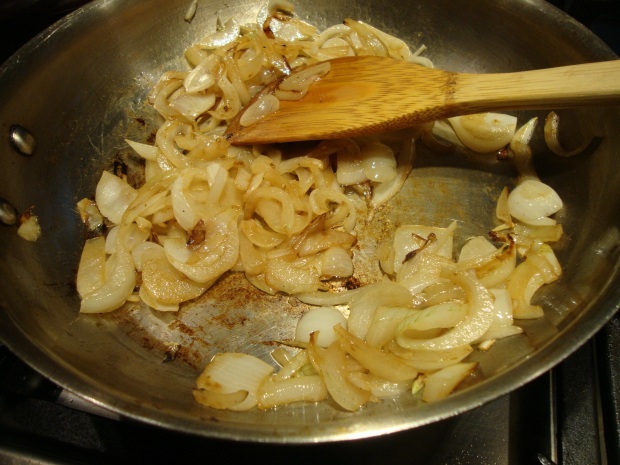 When the butter is melted, add the onion slices to the pan and cook them till they look slightly caramelized. Stir them frequently so they don’t burn. 8. Take the onions out of the pan and set them aside. 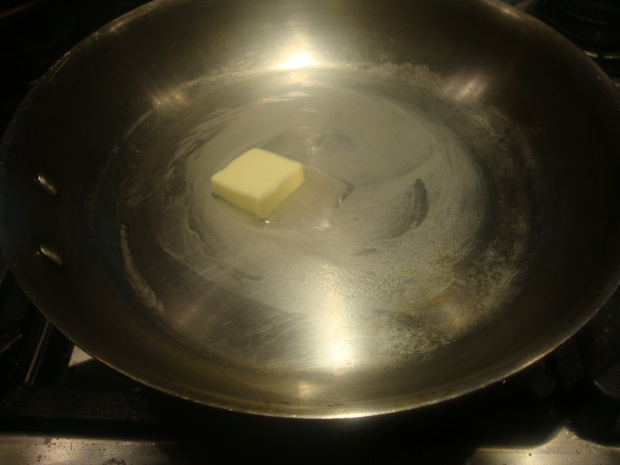 And in same hot pan, add the second tablespoon of butter and let it melt. 9. Place the pieces of meat in the hot pan and let them cook on each side for approximately 4-5 minutes. 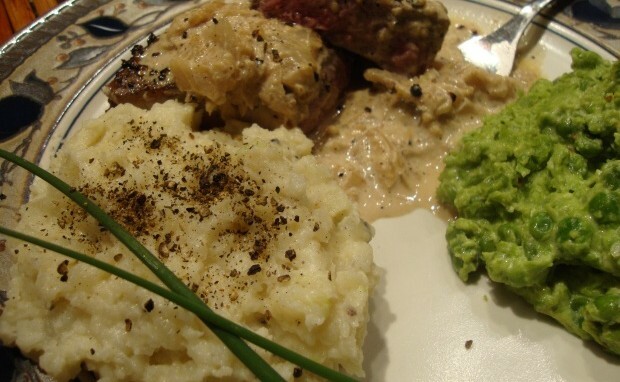 If the pieces are not too thick, reduce the cooking time in order to avoid over-cooking the steak. 10. 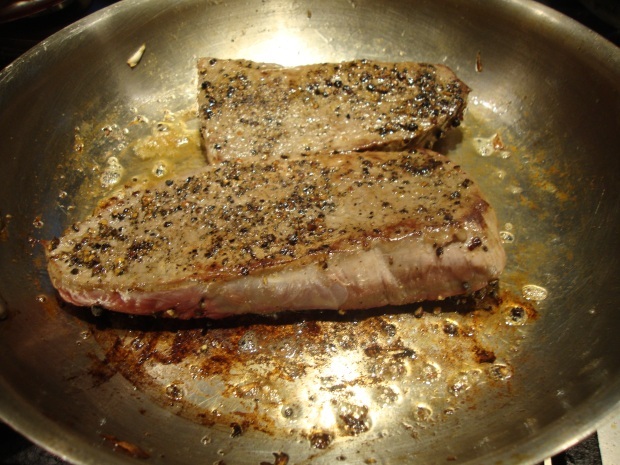 Take the cooked steak pieces out of the hot pan and set them aside on a plate so that they can rest for a little bit. Do not cut into them right away or they lose their juiciness. 11. To make the sauce, de-glaze the hot pan with the cognac. 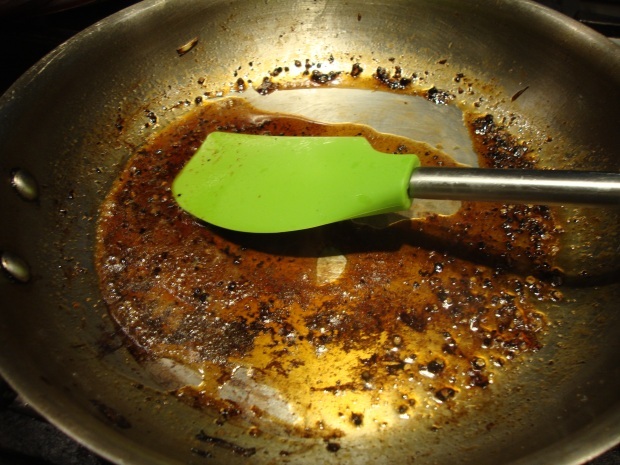 Scrap the bottom of the pan (and all that is stuck at its bottom) using a spatula. 12. After a minute of adding the cognac, add the light cream to the pan and continue cooking (and stirring) it on low heat. 13. 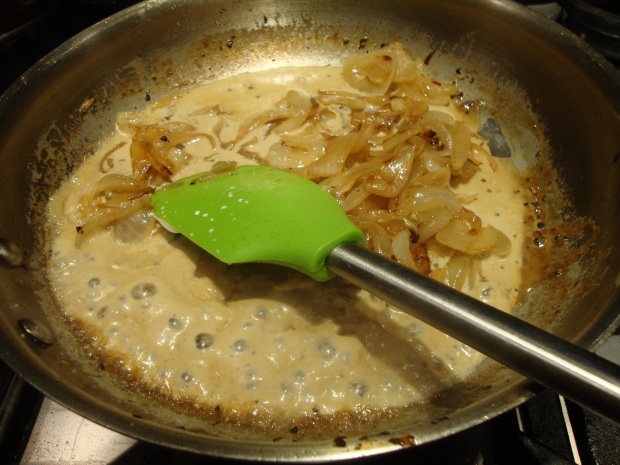 When the sauce starts to bubble on the sides of the pan, add the caramelized onions back to the pan and cook for another 3-4 minutes. 14. 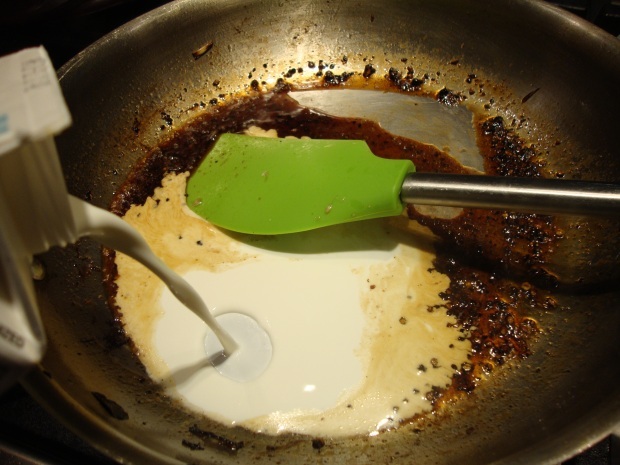 Using a blender (hand-held or the larger kind), grind the sauce to a rough consistency and put it back in the hot pan and cook for an additional minute or so. If the sauce seems too thick, add the stalk to the pan and if it is too runny, let it cook for an additional minute or so. 15. 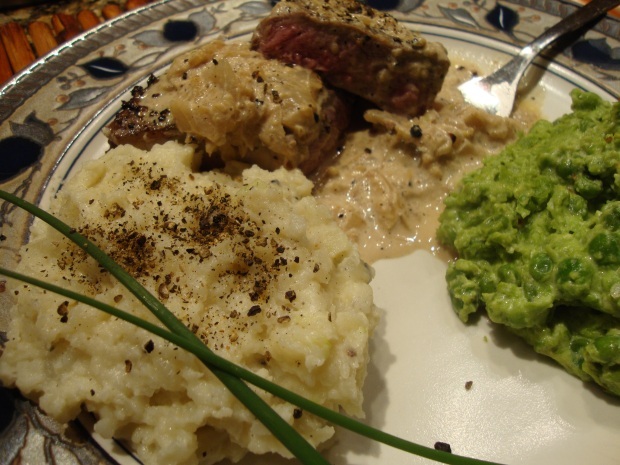 Serve the steak with the sauce poured all over it, with a side of veggies and a side of potatoes. Nothing quite satisfies like a nice, juicy steak!